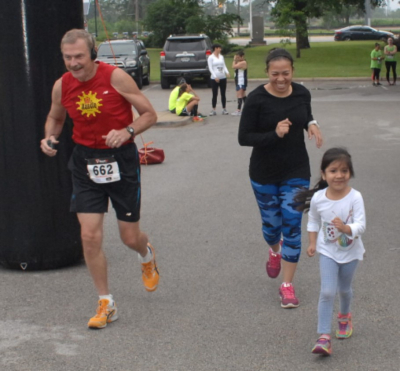 The one mile fun run is free to all. Bring your young one's for the one mile fun run and stay for the grilled hot dogs, snacks and other activities. Then help cheer on the 15K and 5K runners. Come for the run, stay for the fun and food. The course is out and back, flat and fast along the river on the Trinity River Trails. Runners can choose to stay on the paved path or run on the parrallel gravel path. All finishers receive a Custom Finisher's Medal. Want to run a shorter event? (Maybe to get to the fun and food quicker?) The course is the same as the 15K only shorter. All finisher's receive a Custom Finisher's Medal. The money raised from this event benefits St Jude Children's Research Hospital. No one gets a salary as we are all volunteers from the Knights of Columbus Council 8512 and St John Catholic Church and School in North Richland Hills, Texas. The races run through Trinity Park along the river and runners have the option of running on the paved trail or the gravel trail that runs parallel to it. The weather usually is good but can be a little warm or wet. The races will not be cancelled unless the weather is dangerous to the runners or volunteers. Because of the extreme heat and humidity of the 2016 race, the race times have been changed. The races will start earlier. This is a very well organized and professionally run event by runners for runners. The races are chip timed by Cox Racing Services. To learn more about our event click the black "learn more" button below. at race site on day of races.